Successfully Added Mini Wireless Monitoring Video Camera and Receiver Set - PAL to your Shopping Cart. 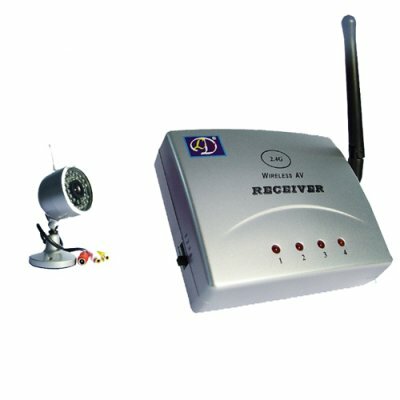 Mini wireless monitoring video camera and wireless receiver set for home and small business surveillance. How does this system work? Simply install the wireless camera in the room you want to monitor and set the wireless receiver in the next room (up to 15 meters away) and hook it up to a TV or DVR to watch the action or record the footage for your security records. Wireless camera monitoring sets are popular for keeping an eye on your employees while you're sitting in your office, watching what your children are doing while they are unattended, or install one looking out to the street to see who it is before you open your front door. Better still, the CMOS camera sensor and 2.4 GHz video stream creates full color imagery that is easy to view on even a small monitoring LCD while being wireless, meaning the camera and receiver are easy for DIY installation for almost anyone. The CVD-310A802 comes at a budget price that makes this mini wireless video camera and receiver set a very economical way to meet your business or family security monitoring or light surveillance needs. It is available right now at a great wholesale prices with no M.O.Q. (no minimum order quantity) from the leader in direct from China wholesale electronics, Chinavasion. This set comes with 1 receiver and 1 camera. For those with a meaner streak, it's amazing what people will do when they think no one is looking - guaranteed to provide hours of laughs!